We are witnessing a Cambrian explosion in the number of blockchain projects coming online. Per CoinDesk, we’ve already seen more ICOs in 2018 than in the entirety of 2017, which is 9x the number that launched the year before that. Now put yourself in the shoes of one of the 1637 projects listed on CoinMarketCap — how are you going to differentiate yourself? I’ve been thinking a lot about this question lately. Sure, executing on your development roadmap or devising a clever go-to market strategy can go a long way towards setting yourself apart from other cryptocurrencies. But there is another strategy that is worth focusing on too — building your community. I believe that building an exceptional community is paramount to becoming a winning cryptocurrency, and there is a playbook for doing so. There is no better way to organically build a community than to put tokens in the hands of as many users as possible when your project launches. Your early tokenholders usually become your biggest evangelists because they stand to make the most money from your project succeeding. They will also stick with you during times of uncertainty, which can be extremely valuable. Last year it was relatively easy to maximize your token distribution. Projects like Tezos conducted large public ICOs that sold their tokens to anyone who wanted to participate. But today, this method of broad token distribution is infeasible given the amount of regulatory scrutiny on the space. As a result, many projects have conducted exclusionary token sales (e.g. accredited investors only) in order to be compliant. This shouldn’t mean we give up on broad token distribution altogether, and in fact, there are still clever ways to maximize reach. For example, Proof of Work coins can do a Fair Launch —this is when a coin launches on a date without any supply issued (i.e. no presale allocation or premine) and allows anyone to begin mining. It’s also possible to conduct a fair and compliant token sale that leverages the latest in Equity Crowdfunding laws, which is something we’ve seen platforms like Republic begin to offer. I suspect we’ll see more projects employ these techniques in the future. If you’re going to convince free agents to join your community, you need to be able to explain to them why your project matters. Projects should establish their core mission and values and then publish it somewhere. If you’re looking for an example of this, check out this blog post by Will Warren on the 0x mission and values. Communication Style — some people prefer Synchronous Communication (discussion that happens in real-time) while others prefer Asynchronous Communication (discussion that doesn’t happen in real-time). Content — some people prefer General Content (e.g. new partnerships or business development roadmap) while others prefer Technical Content (e.g. feature development or technical roadmap). I’ve found the best projects tend to support multiple forums for discussion as opposed to trying to fit as many folks as possible into one chat or message board. One major benefit of this approach is that it allows technical discussion to occur unencumbered by distractions from casual users who sometimes just want to speculate on token price. Projects should ensure that all discussions stay on topic and are respectful. The easiest way to do this is to find passionate community members who are willing to be moderators for free. If that is not possible, projects should consider hiring moderators because it is worth the investment. Finally, founders and core team members should partake in discussions too, as opposed to simply letting the moderators and community managers handle everything. Your most important community members are the developers building on top of your protocol, so make sure they’re happy by troubleshooting their technical problems. While it’s possible for members of the core team to help out with this type of work when your project is just getting off the ground, at some point it’s probably worth hiring a full-time developer relations person. You may also want to hire an employee to handle regular customer support. At first glance this role might not seem necessary, but it’s actually a secret weapon in terms of a generating goodwill in your community. If you’re looking for a good example of this, head over to the Decred Slack and check out the #Support channel — the team does a nice job of helping their non-technical users with problems such as setting up a wallet or learning how to join a staking pool. If you have a treasury, consider setting up a grant program that pays tokens for 3rd-party development of your protocol. This a great way to grow your ecosystem while aligning your core team and community even further. One of my favorite examples of a well-executed and transparent grant program is the Zcash Foundation. Each quarter it funds proposals created by community members that support both the mission and values of the Zcash Foundation. Community-run organizations, which are usually created spontaneously when token holders want to go above and beyond in their support for a project, can be an excellent way to further the your mission as well. One well-run community organization is the Tezos Commons Foundation. The TCF has done well over the past few months supporting meet-ups all over the world and generating grassroots support for the project in way that is complementary to the efforts of the Tezos Foundation. Teams should constantly be spreading the word about their project in order to acquire new community members. There is no better example of this than Vitalik Buterin, who “basically lives on an airplane” and travels to hundreds of events each year evangelizing Ethereum. For other projects, it’s never too early to hit the pavement and begin spreading the word about your protocol. 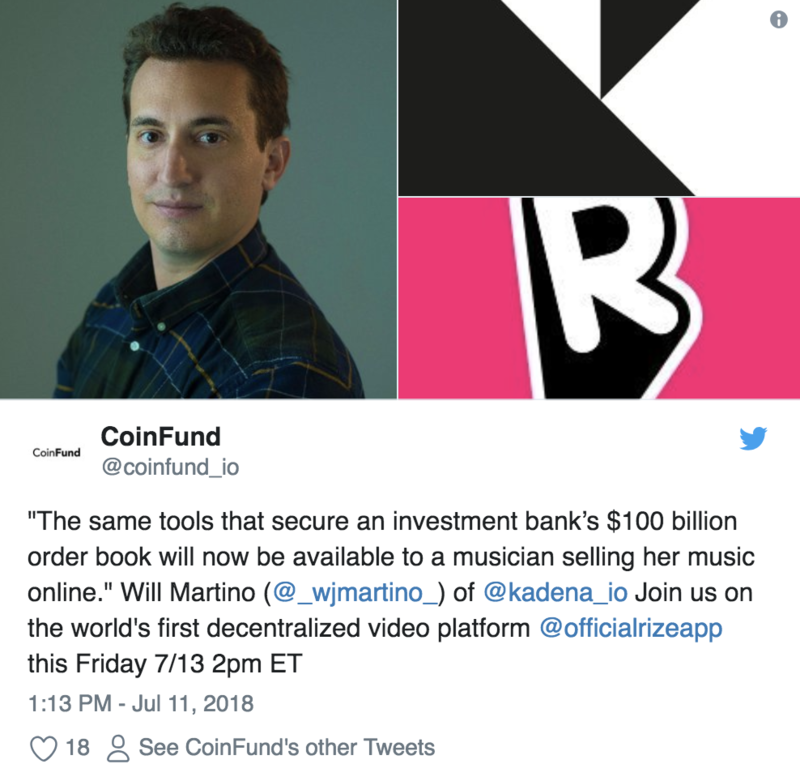 I’ve been encouraged by one of our portfolio protocols, Kadena, which always seems to find good opportunities to spread the word about what they’re building and how people can get involved in the ecosystem if they’re interested. Finally, have fun. A small window into your team’s personality can go a long way towards making community members even more passionate about your project. Here’s Karl Floersch from the Ethereum Foundation showing off his creative side with freestyle rap (and make sure you don’t miss Vitalik clapping at the end!). Ultimately, building an exceptional crypto community is just as important as your technical roadmap and go-to market strategy. With this playbook, projects can put themselves in a position to acquire and retain more community members, which will pay dividends in the long run. Hit me up on Twitter if you have any feedback on today’s post! Investor @dtccapital, former bd/strategy @seatgeek, founder BTCity, investment mgmt @ubs. Macro thoughts on crypto and early fundamentals.